There is nothing that gives us greater pleasure than performing for you – that is our mission and our purpose. However, we cannot continue to play while the threats and demands of CSO Management imperil our Musicians and the Future of the Orchestra. 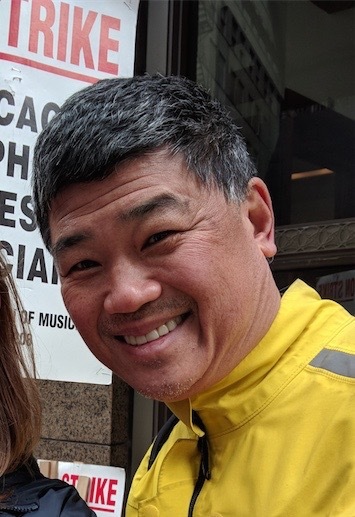 CSO Assistant Principal Clarinet John Yeh on the picket line, March 24, 2019. Substance photo by Sharon SchmidtManagement aims to diminish our health care benefits and end our 50-year old pension plan – critical elements to the well-being of any orchestra. With the orchestras of Los Angeles and San Francisco already far ahead of Chicago in the compensation packages they’ve crafted to keep and attract musicians, we are determined not to let Chicago fall farther behind by letting the Helen Zell – Jeff Alexander led management team to remedy their errors by penalizing the Musicians. Any pension problems are not of the Orchestra’s making but reflect the Board of Trustees’ decision to not fully fund the plan over the last years. We would also fault their decision to spend nearly two-thirds of revenues on the building and non-Orchestra employees and allocate little more than ⅓ of revenues to the Orchestra itself. After all, it is the music that people come for. Maestro Muti saiys, “I am with the Musicians. They are among the best musicians in the world and I understand their needs and how they should be treated.” We hope you agree. Please support our efforts and do not patronize Orchestra Hall until our contract is settled. When the lights went out, CSO took a moment and continued. It was such a nice experience to be there.